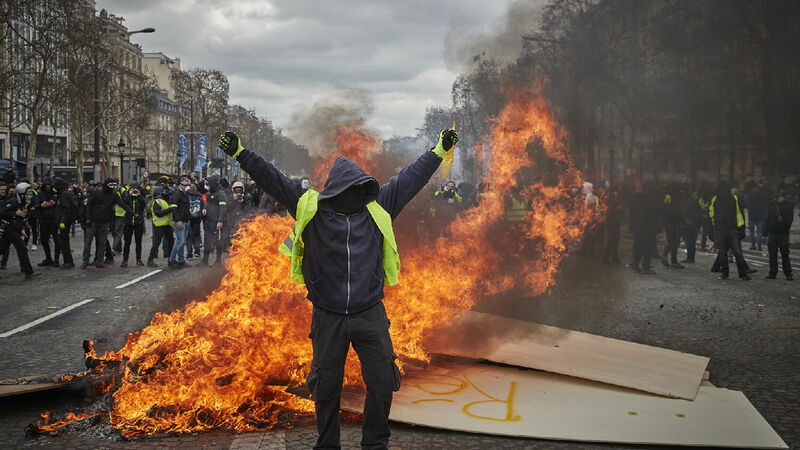 For the 18th week in a row, protesters wearing yellow vests spilled into Champs Elysées, Paris, to vent their anger. The latest wave of protests on March 16 was especially notable for the violence of troublemakers within the protest group, as well as for police inaction. Around 5,000 police officers were deployed against only a few hundred protesters. However, the police force did little to stop the violence, watching while protesters smashed and looted storefronts and burned buildings, cafes and cars for seven hours. Pictures of Paris from last weekend tell the story of renewed levels of violence. One photograph shows a raging inferno started by protesters in a bank, while three stories above a woman holds her baby, looking for firefighters to rescue her. As a result of the weekend’s damage along Champs Elysées, business owners in the area are demanding government action, the Parisian police chief was fired, and the government says it intends to crack down on violent protesters, even by posting soldiers from anti-terrorism units at public buildings. Amid all the violence, French President Emmanuel Macron is trying to figure out exactly how to deal with the protesters. He has just finished making appearances around the country as part of the grand debate, a scheme intended to help his government connect with the needs and desires of the people. Some have said that this campaign was tolerably successful, but last weekend’s protests are evidence to the contrary. One poll conducted the week before the latest protests showed that about half of French citizens support or sympathize with the yellow vests. But the protesters are demanding many things, some of which appear contradictory, such as lowering taxes while increasing state services. “The yellow vest movement mistrusts everything that we call intermediary bodies—it could be the media, local elected officials, unions,” said Jérôme Fourquet, who conducted the poll. These protests will not simply disappear after a public tour and a few appeasement measures from President Macron. The problem is that an entire segment of France is rebelling against the current order. The yellow vest movement represents a larger wave of popular anger sweeping through Europe. In Germany, Belgium and the Netherlands, similar demonstrations have occurred, with protesters identifying themselves by wearing the safety gear they are required to keep in their motor vehicles. Italian Deputy Prime Minister Luigi Di Maio incurred the anger of French politicians in February when he stated that he had met with French yellow vest protesters during a trip to the country and had invited them to a follow-up meeting in Rome. In London on March 20, a group of yellow vest protesters occupied the attorney general’s office. Their issue wasn’t high taxes, but a desire to express discontent with the attorney general and to support Brexit. Protesters wearing yellow vests are appearing in more and more places throughout Europe, becoming a symbol of anger at the establishment. “In a way, it’s a revolution,” wrote Sylvie Kaufmann, a columnist for Le Monde. Unrest and discontent are increasing in European nations as more people look for a change in leadership. They want a leader who will address their concerns. The question is, where will such a leader come from? However, the leader of the coming European empire will not be French, but German. France is descended from the tribe of Reuben, one of the sons of Jacob, as I explained in my November 12 Trumpet Brief. Rather than fighting alongside its natural allies (America and Britain, also descendants of Jacob), Reuben will ally itself to a European empire dominated by Germany (the descendants of Assyria). Since its inception, the Trumpet has warned that Europe will become a superpower. As discontent and protests continue, Europe will move closer to what Bible prophecy forecasts: a strong German leader at the helm of a renewed Europe, more assertive and powerful than ever before. The Bible says Europe will briefly unite as a world power, with severe consequences for the entire world. This empire will inflict unprecedented pain and destruction on the world before Jesus Christ returns to permanently end the suffering (Daniel 2:40-44). To understand more about how this leader will come to power and what it will mean for our rapidly changing world, request your free copy of A Strong German Leader Is Imminent, by Trumpet editor in chief Gerald Flurry.